Wednesday night, a new band played their first performance in Indianapolis. If I say it three times, will that make it true? 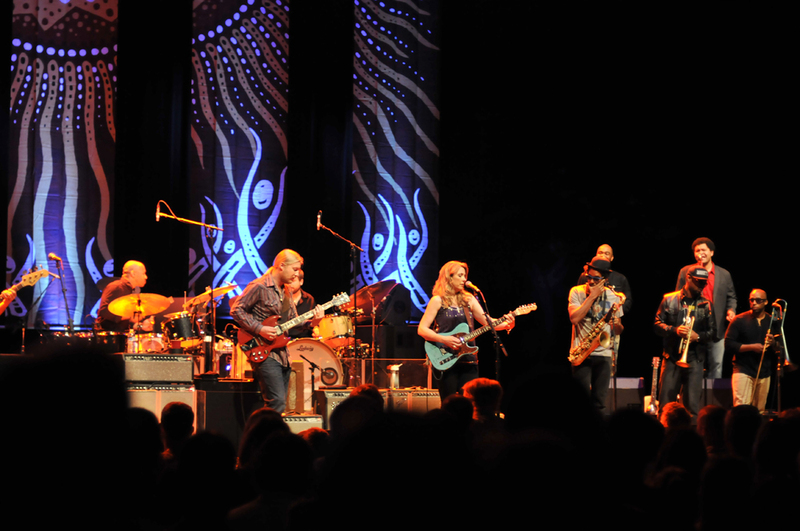 Tedeschi Trucks Band played Murat Theatre at Old National Centre for their debut Indianapolis performance. However, even the most casual modern blues fan should be familiar with the cast of characters. Critics and fans have hailed guitarist Derek Trucks, only 32, as one of the genre’s shining stars since he rose to prominence as a teenager, gigging with his uncle Butch in the Allman Brothers Band. Lead singer Susan Tedeschi is a multiple GRAMMY winner with a dedicated following of her own. TTB functioned as much like a jazz ensemble as a guitar-driven blues band. The 11-piece band filled out the Murat Theatre stage with dueling drummers, horn section and backup vocalists. Each member enjoyed their time in the spotlight. Mike Mattison, former frontman of the Derek Trucks Band, offered memorable lead moments on “I Know” and “Get What You Deserve”. Kofi Burbridge left traded his post at the keys to duel with Trucks on the first few bars of DTB track “Mahjoun” before stepping back to allow the drummers to have their turn. It’s rare to see such talented musicians so willing to share in the glory. As is the case with any traditional blues performance, TTB’s was as much about the past as the present. Though the originals provided plenty of reason for applause, so too did their cover songs. Susan Tedeschi underscored her strength as a lead singer on her hair-raising rendition of Bobby “Blue” Bland’s “That Did It.” The song was a far cry from the restrained version that Bland laid down so many years ago. Derek and the boys played one of the most original takes of “Rollin’ and Tumblin’” that I can recall, offering a bouncy, Spanish-tinged rendition that was worlds removed from the track that Robert Johnson made famous. TTB also made Harry Nilsson’s classic “Everybody’s Talkin’” their own, with Trucks content to riff chords beneath Tedeschi’s powerful pipes. I’ve spent the better part of the last year doing my damnedest to uncover up-and-coming or unheard artists for the readers of this blog. The process of discovering new music is thrilling, and I wouldn’t trade it for anything. After a while, it becomes easy to forget what a seasoned, road-tested group of pros sounds like. Wednesday night showcased a band that rarely misses a beat. They know which buttons to push and when to drive the audience into a frenzy. Trucks did nothing to disprove my belief that he deserves discussion as one of the planet’s premier guitarists, and the musicians standing behind him were deserving of the honor. As much as I enjoyed Wednesday night’s show, even the sweetest moments were paired with a hefty dose of bitterness. It was impossible for me to look up at the Murat Theatre stage without the reminder that this band replaced one of my favorites. Some of the best moments of my college career were spent getting my face melted by Derek Trucks Band. I was in the audience at Chicago’s Park West when they recorded what would be their final live album Roadsongs. I love Harry Nilsson, but I miss those moments of Derek diving headlong into traditional Indian ragas like “Sahib Teri Bandi” and “Maki Madni.” The simple fact remains that Derek Trucks Band would not have been playing at Murat Theatre on Wednesday. They struggled to fill The Vogue the last time they were in town. Trucks appears content in his current role, and I have no doubt that the rigorous touring schedule is more tolerable when the family can travel as a unit. Maybe one day I’ll come to appreciate TTB in the same way that I did DTB. For now, though, the wounds are still too fresh, the memories still too clear. I still want my band back.